Home > My Passion.....Bikes > 2008 Yamaha YZF R125 - Why not!! 2008 Yamaha YZF R125 - Why not!! Well, the 125cc segment in India is a hot cake these days, and sensing that the Indian bike players are trying to bring more and more exciting bikes for this segment (the Yamaha came up with it's Gladiator Type SS and RS, Honda with CBF Stunner and Bajaj re-modeled it's Discover 135 and is on the verge of releasing the all new Bajaj XCD Sprint 125). But in this race of wooing the commuter class in the 125cc segment, have any of the Indian Bike manufacturers thought what they can offer to the non-commuter class of bikers in the 125cc segment? I guess non of the major players didn't even bother to think on these lines. It is for this increasingly neglected segment of non-commuter bikers, for whom is the 2008 Yamaha YZF R125. Compared to the Honda CBR 125, the Yamaha YZF R125 has got the attacking looks, and comparable engine performance and figures. 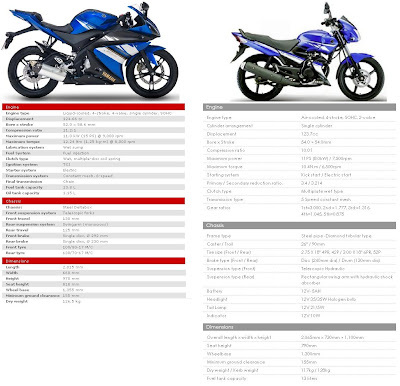 I would say, the YZF R125 is a more desirable sports class bike in the 125cc segment. With it's 4 stroke single cylinder engine pumping out whooping 15PS @ 9000 rpm (that's a 15occ number!! ), I don't see the Honda CBF Stunner standing anywhere near to this babe!! My guess is, if Yamaha decides to launch this bike in India (which I think it should) and even if Yamaha is not able to price the bike in the range of the existing 125s and touches the range of the 15os, the bike would find a great costumer base, just because if we compare the technology of the bike, the power of the bike, and above all the looks of the bike, they are all KILLER!! All these wonderful bikes can paint such an exciting picture for the Indian non-commuter biking segment, if only the Indian Bike manufacturers will to take that extra step. You know what... excites me about the R125 is that, it just goes to show that what you can do with a 4-stroke single cylinder engine!!! the same configuration that runs on most of the 125cc bikes in India and produce only 11PS at max, Yamaha pelted out 15PS from the same configuration. It just goes to show, you need to have the right mindset to give rise to something thats radical!!! The R125 has a liquid cooled engine and hence can rev higher easily than air cooled engines.. and hence make more power..
More over the materials used for the R125 is exclusive to that particular model and not like the R15 sold in India which shares its body and engine parts with other Yamaha models from South East Asian countries. 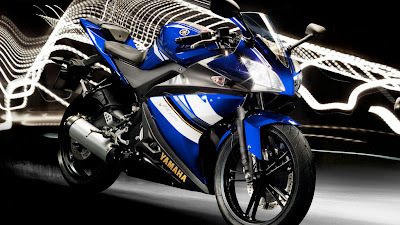 The YZF R125 sells in U.K for around 3000 British Pounds (or Rs. 2,40,000 Equivalent Indian currency)..
You get the picture there. Yup I knew the why the R125 cannot be sold in India and as to why it makes more power than the other 125cc machines in India!! Alas.. looks like will remain a dream. By the way, the 150cc Yamaha FZ16 has been launched in India.. check out the Yamaha India Website for tech specs and pics. Didn't you go for the test ride?? Go for it dude go for it!!! !